We propose the Area of Excellence to pursue cutting-edge research for emerging electronic devices and integrated circuits. As the future of the electronic industry is in smaller devices, we will focus on studying sub-22nm semiconductor devices. 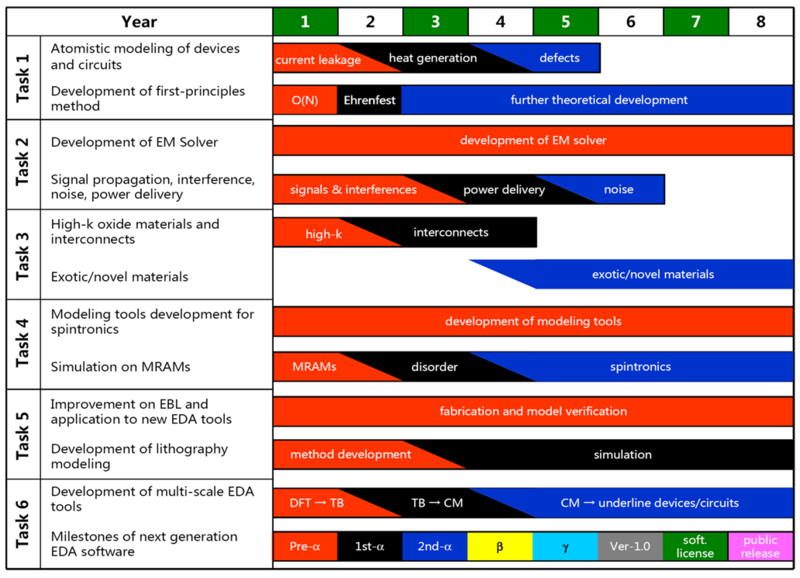 By working with device engineers and experimentalists, we aim to develop next generation EDA tools and thus become an important player in developing next generation electronics. As China is developing rapidly its semiconductor industry, we hope to play an important role in this development. As Hong Kong is transforming itself into a knowledge-based economy, research and accomplishment in high profile science and technology become more and more important. Hong Kong is a world city in many areas such as finance. However, Hong Kong is still well behind other world cities in the US, Europe, and Japan in education, science, and high technology. Our proposed AoE aims at the scientific and technological challenges of emerging electronics. In the long term, we will position our centre as a leading simulation and design centre for material discovery and new technologies, such as photonics and photovoltaic. It is our AoE's mission to make Hong Kong more visible in science and education, and promote Hong Kong's intellectual status internationally. China's economy is growing rapidly, and China is developing rapidly its semiconductor industry, and has invested heavily in research and development in the field. Many leading Chinese researchers in the area of nanoelectronics are former students and postdocs of our team members. Our AoE is proposed to actively participate in and possibly to be one of the leading groups in China's R&D efforts in the emerging semiconductor technology. This should help Hong Kong to position itself as one of the top centres in science, technology, and higher education in China and in the Asia Pacific region.